After languishing in the lower half of the points table after the technical ginger bread cake decorating challenge and failing to impress the child judges with their rendition of Monty Python's famous "Always Look on the Bright Side of Life" and blatant Toblerone give away at the initial team presentation, the plucky Brits shot up in to medal contention after winning the most challenging individual event of the Championships - Present Delivery Via Donkey And Chimney Climbing. "We always knew it would be an uphill task to make the finals," said youthful team captain Sam Thorne, "Some of the other teams are real veterans on the Santa circuit and they had local support. Plus our team's average age was 42 - double that of most of the other teams. Being a top Santa these days is a young man's game." However it was the most physically challenging event that catapulted the Brits in to the final. Team members Patrick Thorne and Alan Hunt loaded presents in to a sack whilst Sam encouraged a donkey to carry these across a snowy field to a five metre high chimney where Ian Brooks, the teams fourth member, was ready to carry the sack up a five metre high chimney. Other teams saw their donkey's stall but the combination of skillful donkey whispering by Sam, donkey cuddling by Alan and the brute-force of Patrick against the donkey's rear end got them, rapidly over the line and Ian made a speedy ascent. The final event - snow carving - saw Patrick recreate his one art work, Thomas the tank Engine, embellished by the Angel of the North statue recreated by Alan Hunt from his home town, Newcastle Upon Tyne. Qualifying for the finals was an unexpected bonus for the team, who continued to come mid-field in the Santa Biathlon and Flying Santa events in which team member Sam bounced high on a bungee trampoline whilst collecting presents thrown at him by other team members. The final event was the Santa Show in the festival tent where Sam Thorne performed Nickelback's ‘How You Remind Me' to a high standard, supported by a slightly out-of-tune Alan Hunt, whilst the rest of the team recreated ZZ Top videos on air guitar/drums. But with scoring reliant largely on apparently faulty Sony Playstation ‘Sing Star' software and a partisan crowd, the writing was on the wall for the plucky Brits. "All in all it was a great event and I'd encourage anyone to take part next year in the ninth Championships," said Sam Thorne, "The Swiss currently dominate the event and it would be good to see more international teams joining ourselves, the Germans and the Belgians in taking them on." 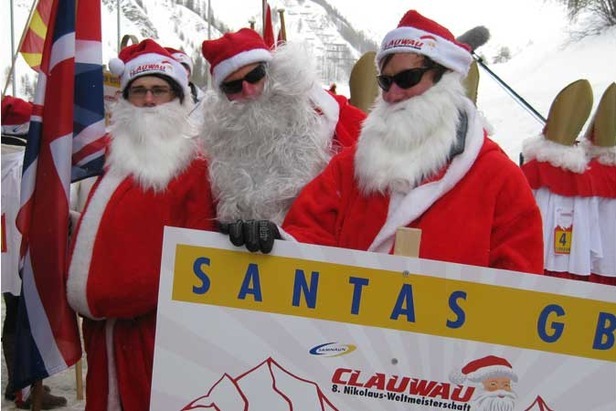 The British team would like to thank Switzerland Tourism, Samnaun and Swiss Air Lines for making their participation possible and will be donating to a British cancer charity as a result of their participation.